What a beautiful surprise to collaborate with a sister national. One Sunday I get this call from Mallow and as I was listening to her voice, I couldn’t understand what she was saying, expecting English, I was baffled to listen and lavish in my own Romanian language. Lavinia is an amazing jewelry crafter, playing with silver sterling and Swarovski crystals, and, as a result, her products are purely outstanding and sparkling. She created the brand so pretty called Magpie Gems and as it goes: one is for the color, two for the joy, three for a girl, four for a boy, five for silver, six for gold, seven gems always to hold, eight for a wish, 9 for a kiss, 10 for a jewelry you must not miss. That’s truly sweet. 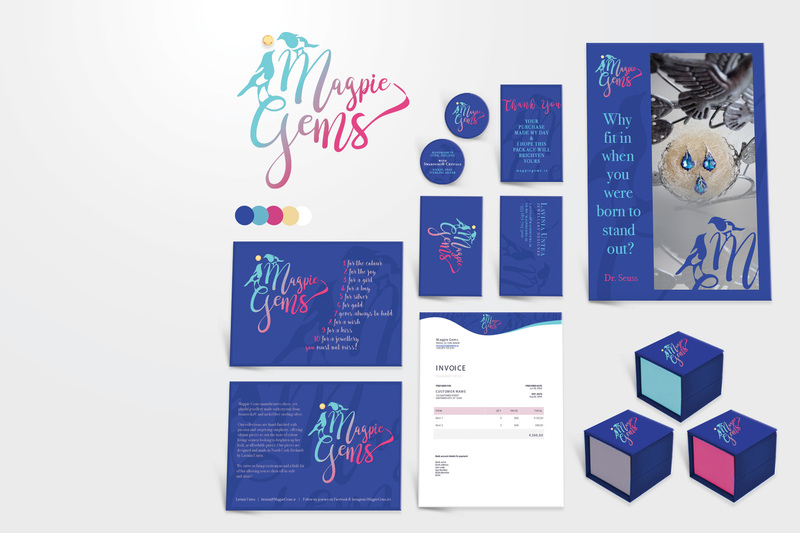 For her Magpie Gems business, Lavinia needed a strong branding and graphic design for print: logo, packaging design, business card, thank you card, tags, flyer, poster, and invoice design. She is also thinking to launch her shopping website soon. Can’t wait for that! In the meantime, you can check her masterpieces here.